If you are new to polytunnel gardening, following the square foot gardening system may help you to get started with growing your own food. The phrase ‘square foot gardening’ was coined by Mel Bartholomew in his book of the same name, published in 1981. A retired engineer, Bartholomew brought is orderly mind to bear on the oft chaotic world of kitchen gardens. He designed a gardening system in which more food could be grown in less space. In this system, raised beds that are 4ft square are created. These beds are then separated into sixteen one foot squares, forming a grid. Each of these squares is then planted with a different crop, the number of plants in each square depending on the size and requirements of the crop planted in each. Once each square foot is harvested, another, different crop can be planted within it, allowing for a continual harvest. In 2006, Bartholomew updated the concept of square foot gardening in his book, ‘All New Square Foot Gardening’. In this book, he advocated the creating of raised beds just 6 inches in depth, filled with a mix of equal parts compost, peat moss and vermiculite which he concluded, after extensive research, gave the best results. This mix eliminated the need for artificial fertilisers, since each square is replenished with compost each time a square is replanted. Like almost any gardening system that has been developed over the years, square foot gardening has both pros and cons. In order to determine whether square foot gardening (or some elements thereof) are right for you, it is important to examine these pros and cons in relation to your own garden, gardening style, preferences and requirements. Square foot gardening can give high yields in small spaces – far more food can be grown in this way than can be grown in a comparable space given over to traditional rows. Growing a variety of different crops close together is a form of companion planting, which increases biodiversity and helps to reduce the threat posed by pests and disease. Intensive planting minimises bare soil and acts like a cover crop to protect the important soil ecosystem that lies below. Closely planted crops also help to minimise the number of weeds that germinate and establish in the beds. The neat, raised beds of square foot gardening make it easier to garden if you are getting on in years or have mobility problems. The orderly nature of the system also makes it easier to stay on top of things and create a good plan for the whole of the gardening year. The soil-free growing mix proposed by Bartholomew further reduces weed problems and ensures high fertility in the raised beds. The raised beds and the garden system are easy to set up, even for complete beginners. 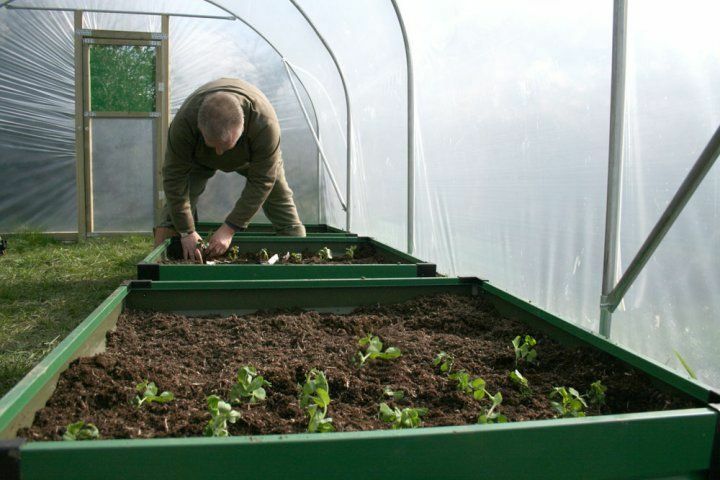 The small beds are easier to cover with cloches, cages or cold frames to protect your plants than more sprawling and less intensively managed beds. Square foot beds (like all raised beds) require more water, as they will dry out more quickly than in in-ground growing growing areas. While fewer weeds develop in square foot gardens, those that do establish are harder and more time consuming to remove, as you will have to weed little and often, by hand, rather than going between traditional rows with a hoe. It is important to remember, when setting up a new growing area in your garden, that you do not need to follow one system religiously. While there are many things to recommend a square foot garden, it may not be right for you. Or, indeed, some elements of the system may work for you while others need to be changed or adjusted to suit your individual needs. Be open to altering the ideas as you learn and garden, and you will end up with a polytunnel garden that is best suited to you. Once you have determined a layout for your polytunnel and worked out where your new square foot raised beds will go, it is necessary to determine how large or small each one will be. As long as the beds are a whole number of square feet in length and width, and as long as you can easily reach each square on the grid without standing on the beds, you can make them as large or as small as you wish. While there are a number of square foot garden kits that you can buy to make the edges of your raised beds, you can also consider keeping costs down by making your own. There are a number of different materials that you could use – reclaimed wood from old pallets is a popular choice, though you could also use bricks, reclaimed concrete blocks, stones or even logs from your garden or from local woodland. The grids to demarcate the squares on the surface of your raised beds can also be made from natural or reclaimed materials – bamboo canes, for example, straight branches pruned from garden trees, natural twine, or perhaps reclaimed plumbing pipes. Once you have created your raised square foot garden bed structures, it is time to fill them with your growing medium. You may choose to follow Bartholomew’s book to the letter and use a soil-free mix of peat moss, vermiculite and compost as he suggests. If you would like a more eco-friendly and sustainable soil-free mix, you could consider using coconut coir as an alternative to peat moss and ‘pine fines’, finely ground pine bark, as an alternative for the water-retentive vermiculite. You can buy your compost, but it is far more cost effective and sustainable to make your own. If you do not already make your own compost from vegetable scraps and other garden and kitchen waste, now is the time to get started. Make sure you have started your own composting system before you begin to plant, even if you have to buy in compost to get started. Another thing to consider is building up your raised beds for square foot gardening using the ‘lasagna’ method. This method involves, basically, composting materials not in a separate heap but in the raised beds themselves. Create thin layers of ‘brown’ carbon rich material (such as straw, cardboard, brown leaves, chipped wood/ bark), and ‘green’ nitrogen rich materials (such as grass clippings and fruit and vegetable scraps). Build these up to the required height and then top the beds up with a top layer of good quality compost. The largest plants that can easily be included in a square foot gardening system will require one whole square foot each. These include brassica such as cabbages, broccoli, Brussels sprouts & cauliflower, geraniums, tomatoes, peppers, aubergines and herbs such as coriander, rosemary, oregano, sage and mint. Some plants in this category could grow to full size if planted one per square foot, but can be more intensively planted if you harvest them as they grow, which will keep them in check. These plants include leaf lettuce, chard, Swiss chard, parsley, basil and a number of other leafy greens. Dwarf marigolds, an incredibly useful companion plant, can also be spaced at four per square foot. Crops in this category include bush beans, peas, beetroots, large turnips, parsnips, kohlrabi, bok choi and spinach. Each of your seeds or seedlings will be placed at four inches apart. Carrots, radishes, onions, garlic and spring onions are all examples of plants that can be grown intensively at a spacing of 3 inches, in blocks of four by four. When planning your planting scheme, take into account how much of each crop you wish to grow and the requirements of your own household. You will also need to consider the requirements of the plants in question, and whether each crop you choose will do well when planted next to its neighbours. Remember also to consider companion planting and crop rotation when deciding what to grow where. Do you do square foot gardening in your polytunnel? Let us know how you are getting on in the comments below. Find out more square foot gardening tips in this handy guide we’ve found.